My first reaction to this book was WOWZERS! I turned to the last pages and found a young adult study guide at the back. As it turns out, the book is actually considered a young adult book. WHAT?!? So, second reaction was, I was reading a teen book, and didn’t notice! I am both flabbergasted about what defines youth fiction, and amazed at the care and time put into this book. What an amazing piece of fiction. Zusak in The Book Thief has given me a story I will remember for the rest of my life. The Book Thief is set in the years of the Second World War, in Germany. The main character is a ten-year old girl named Liesel whose mother is bringing her to a foster home. Her mother must leave them because, for reasons unknown to the reader, she can no longer take care of Liesel or her brother. On the train ride there, Liesel’s brother dies. Enter: the narrator. He makes his grand entrance by taking away the soul of her brother. This is the crux of the book and what makes it so brilliant. The narrator is death. It is a unique literary technique to personify something so tangible, yet universally feared. And it also gives something to the book that makes it very much alive (ironically). Zusak makes the book bearable, for such a sensitive soul as myself, with humour and reality. At this time, death is busy. He is busy taking souls away all over the world. But death, as portrayed in The Book Thief is tongue-in-cheek funny, poetic and sensitive. We know he has feelings for those left behind. We follow beautiful and vivacious Liesel, through her adolescence. But the reality of her pubescent years is a harsh one, with bomb shelters, Hitler Youth meetings, and stealing from farmers because they have nothing but watery (pea) soup. The author impressed me with the absoluteness that life and love fill the cracks of human brokenness and suffering. Hans, her foster father teaches Liesel to read, and she becomes the book thief, someone who steals books because she loves them so much (naturally I can relate to a love of books). The snatching of literature become the foundations of her life and soul. Giving flight to her thoughts and helping her to make sense of the grave world around her. The most significant character in the book is Max Vandenberg, a hunted Jew who comes to Hans for hiding. In World War One Max’s father saved Hans’ life. To return the favour, they hide Max and feed him, but his spirit is broken, and he wishes to hide like a rat in the cold dark basement. It is Liesel, and her vitality, that keeps him alive. She reads to him, and listens to his stories and they soon develop a depth of friendship that can allow their souls to survive Nazi Germany. In one moving chapter, Max rips out pages from his copy of Mein Kampf. He paints over the words with white paint and hangs them to dry. He than writes a story with black paint over top of the pages about surviving and about being alive. The end of the novel is hard to get through. It is sad. But I also felt prepared for it, because in this world is death really a surprise? It is the hope that the life of those remaining continues even after the death of loved ones. For some reason, the reader is comforted as well, by the fact that life was so present before hand. I think most people have a general interest in WWII. If you like to read about the social history of war-time in Germany, this book would interest you. It is also unique, because the perspective of a nonconformist German family during WWII is somewhat uncommon in literature. But even if that doesn’t really interest you, the characters are memorable and the writing is dazzling and full. Zusak is a talented author, with emotion spilling out of the words he writes. In the beginning, it took me a bit to get a hold of the narrative. It was hard to place the narrator, and for good reason (but once you realise who the narrator is, you can jump right in). The only other issue I have with the book, is that I had never heard of it. It was published in 2006, but it was marketed as a young adult book. I think it could have been more broad than that. The book deals with love, loss, lust, survival, death and war. These are done in a mature and thought-provoking way. Please, do yourself a favour and read this one. The author’s website is worth a perusal (if I piqued your interest). 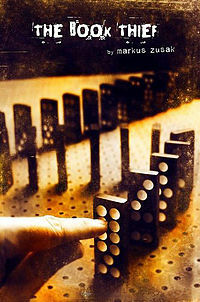 An interview with him about The Book Thief can be found here. Or read the first chapter of The Book Thief.